More than 500 movie theaters across the nation will welcome marching music fans on Thursday, August 11, as Drum Corps International teams up with Fathom Events to broadcast the DCI World Championship Prelims live from Lucas Oil Stadium in Indianapolis. The start of the competition for the 2016 DCI Founders Trophy will feature the top-15 World Class corps in this 13th annual one-night cinema event. More than 45,000 drum corps enthusiasts attended in 2015. 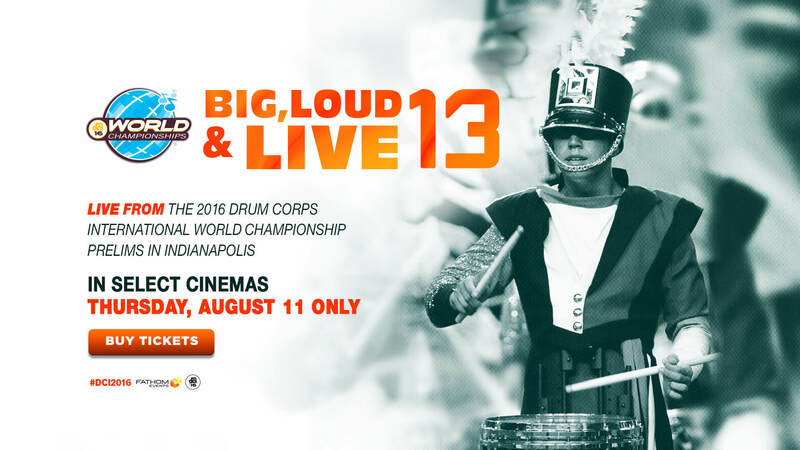 “Big, Loud, & Live 13” will hit the big screen at 6:30 p.m. ET/ 5:30 CT/ 4:30 MT/ and 3:30 p.m. PT on Thursday, August 11. Learn more about “Big, Loud & Live 13” and find a theater near you.